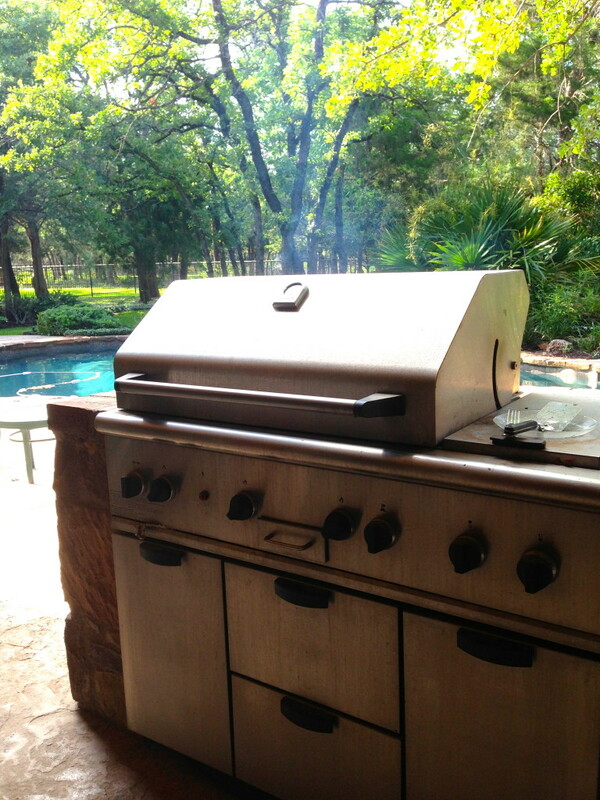 I don’t know about you, but summer is definitely my favorite time of the year. I used to like cold weather better… bundling up in warm jackets, sipping hot chocolate, and sitting by the fire, BUT…. as I’ve gotten older, I’ve come to LOVE being outdoors! Being outdoors in the sun and warmth mean getting a tan, working up a sweat from a nice long run, pool parties, backyard grilling, summer vacation, more daylight, and more productivity (at least for me)!! I love anything grilled, and this pork tenderloin, was fast, easy and healthy. It’s got a nice smokey taste to it from the adobe chilies, paired with sweet maple syrup and tangy cider vinegar, for a surprisingly good combination of flavors. My parent’s cat, Pippa even liked the tenderloin. (Yes, Pippa is named after Kate Middleton’s sister. Silly, I know….but a super cute name for a cat). Pippa is not your normal cat. She is not independent or weird, or aloof like most cats. In fact, she behaves like my dog Skippy… a lap dog who loves attention, food, and being petted. 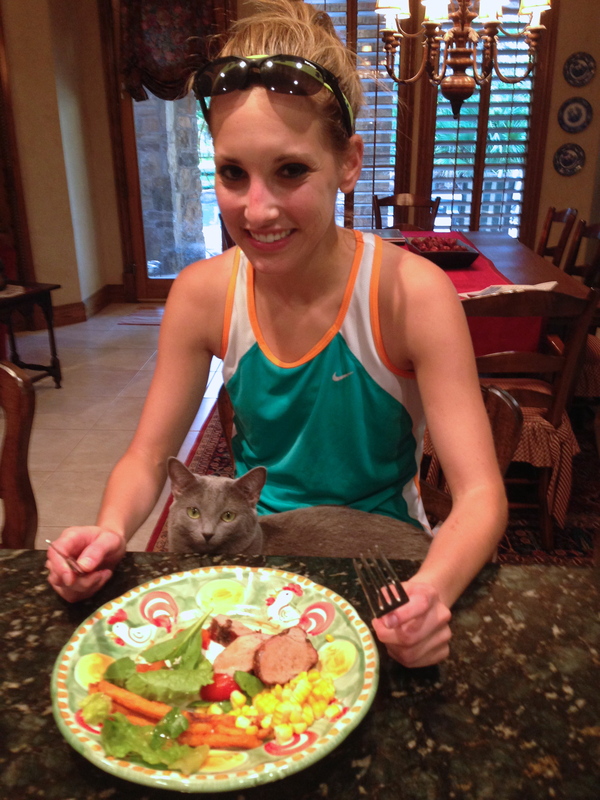 Who ever heard of a cat begging for people food…. in your lap??? Enjoy the rest of your summer and TGIF!! TO PREPARE PORK: combine first 6 ingredients; sprinkle evenly over pork. Place in a large zip-top plastic bag; seal and refrigerate 3 hours. Remove pork from bag. Place pork in a roasting pan; drizzle with oil. Bake at 375 for 30 minutes or until a thermometer inserted in center of pork registers 155 degrees F.
Remove pork from pan; cover and let stand 10 minutes. TO PREPARE SAUCE: remove 2 teaspoons adobo sauce from can of chiles; reserve remaining chiles and sauce for another use. Add 2 teaspoons adobo sauce, syrup, broth and vinegar to roasting pan, scraping pan to loosen browned bits. Cook over medium heat 5 minutes, stirring constantly. Remove from heat. Place pork in pan, turning to coat. Remove pork from pan, reserving sauce in pan. 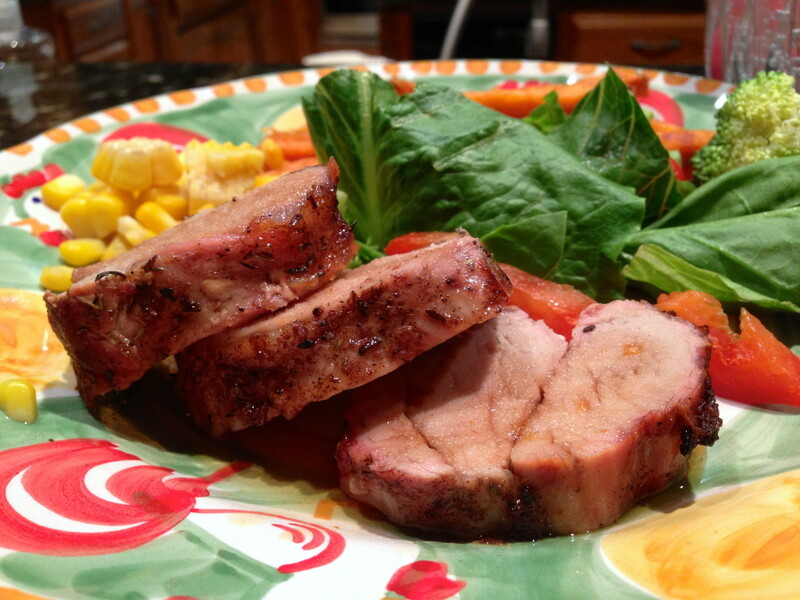 Cut pork into ½-inch thick slices. Strain sauce through a fine sieve into a bowl; serve with pork. 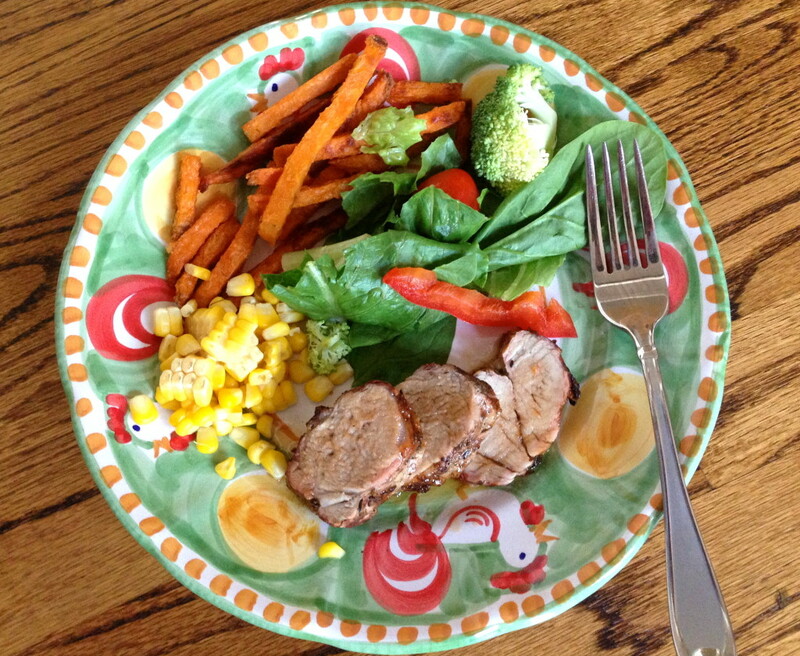 One Response to "Spiced Pork Tenderloin with Maple-Chipotle Sauce"